One of the best aspects of Insomniac’s most recent Spider-Man game is the dozens of alternate costumes from Marvel’s Spider-Man comics that you can equip in order to gain special abilities and give Peter Parker a new look. You’ve got your Spider-Punk, and your vintage comics Spidey, but let’s be honest here. The most impressive of the game’s suits is the one at the top of this page. 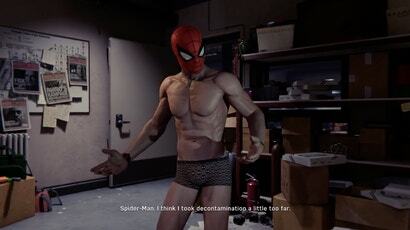 Peter’s “Undies” suit makes its first appearance during the “Streets of Poison” mission in which a poisoned Spider-Man must frantically weave his way through New York while fending off horrific hallucinations of the city being flooded with poison and besieged by gigantic monsters. While the city isn’t really flooded, the substance in Peter’s system convinces him that it is and falling into the bubbling green ocean causes him intense pain. The goal of the mission is to successfully make it to a number of labs scattered across the city where you develop an antidote to the poison. Once you do, Peter comes to his senses and realises that, unbeknownst to him, he at some point took off all of his costume save for his mask. You’re meant to understand that while Peter was swinging about and fighting imaginary monsters, countless people witnessed him running around in his skivvies and, one imagines, took plenty of photos that quickly flooded J. Jonah Jameson’s inbox. Unlocking the Undies suit so that you can wear it while playing is a grind to say the least, but once you’ve completed every single one of the game’s missions and side quests, it’s yours to don. Like all of Peter’s other suits, the Undies don’t really do all that much to change the game’s mechanics, especially considering that you can always equip another suit’s special ability whether you’re wearing it or not. What’s special about the Undies, though, is the gaze-y way that it makes you pay attention to and appreciate Spider-Man’s body. There is, of course, a certain degree of titillation that comes with seeing the hero in nothing but boxer briefs and a mask, but more than that — the suit also highlights the inhuman feats of athleticism that the radioactive spider’s bite imbued him with. Everyone knows that Spider-Man has the proportional strength of a spider, but you really get a sense of just what that means when you can see every muscle in his body working overtime to keep a runaway car from smashing into innocent bystanders. Spider-Man comics (and those closely connected to them) have a somewhat infamous history of going out of their way to needlessly sexualize female characters like Spider-Woman and Mary Jane Watson for reasons that have little to nothing to do with the stories’ plots themselves.